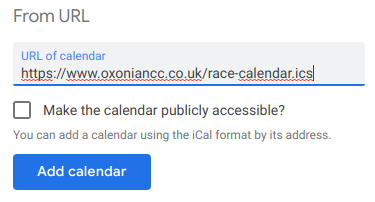 Copy and paste https://www.oxoniancc.co.uk/race-calendar.ics into the box. 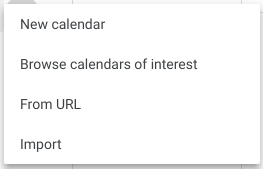 You do not need to select the “make calendar public” box. Press “Add Calendar” and the calendar should now appear as “Oxonian Races” in the list of available calendars on the left. If you use an Android phone, it should now appear in the list of available calendars on your phone. If you use an iPhone, go to https://calendar.google.com/calendar/iphoneselect and select “Oxonian Races” from the list in order to sync it with your phone.